Liscio’s Bakery, a family business that outgrew its 35,000 square foot plant, purchased a 100,000 square foot industrial facility to accommodate its growth plans. They chose Pete Porretta of Lighthouse Architecture to help them with the structure’s adaptive re-use into a modern food processing plant and corporate headquarters. The facility was originally constructed as plastics plant in 1970 and later converted to coca processing by ADM.
Gutting and reconstruction was put on a fast track timeline. While the interior demolition took place, modifications to the exterior including new loading docks were designed. As that work progressed, Pete and the team designed the bakery and office. The project met the target of baking bread for the 2015 holiday season. 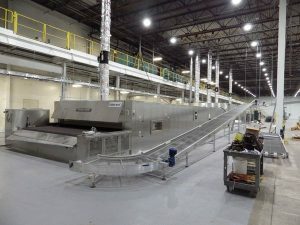 Lighthouse Architecture was chosen to be part of the team that transformed an obsolete facility into a modern plant compliant with international food processing standards. This new facility is triple the size from Liscio’s previous plant. It accommodates their current growth and future plans. Learn more about Liscio’s Bakery by visiting their website HERE.